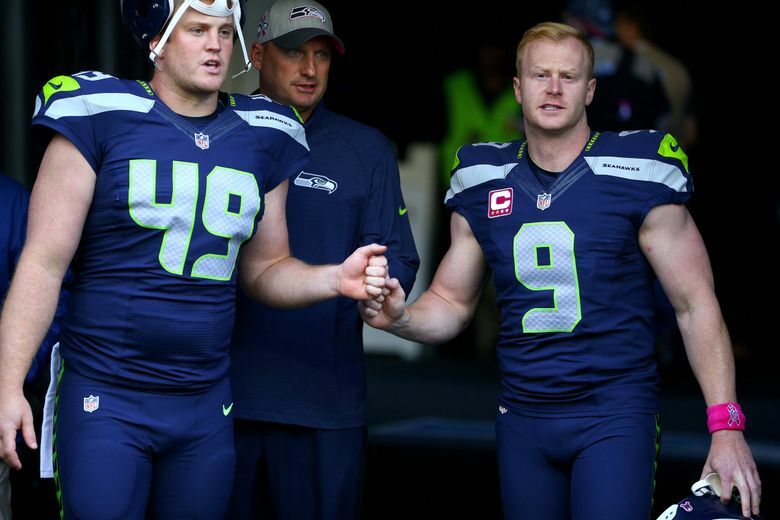 Punter Jon Ryan revealed via Twitter Friday morning that he is staying with the Seattle Seahawks. He is the fourth unrestricted free agent to re-up with the team this week. As Jon Ryan packed up boxes of shoes and other mementos of the season on the Monday after the Seahawks’ divisional playoff loss in January, he had no choice but to contemplate that he might be leaving the VMAC for the final time. Friday, Ryan finally learned what would happen, and was so happy at the news that he took to Twitter to report that he had agreed to a four-year deal to stay with the Seahawks. “Found out this morning that I will have the honor of playing in front of the greatest fans in the world for 4 more years,” wrote Ryan, who is expected to sign his contract next week. NFL.com reported that the deal is worth $10 million total with $2.4 million guaranteed. Ryan, 34, is now the longest-tenured Seahawk, having been with the team since 2008 — the last player remaining who pre-dates the arrival of coach Pete Carroll after the departure earlier this week of defensive tackle Brandon Mebane. Ryan, a native of Regina, Saskatchewan, signed with the Seahawks shortly before the 2008 season began after being released by Green Bay. Last season he finished a six-year deal signed in 2010 and became a free agent. That deal totaled $9.1 million, with Ryan making $1.5 million in 2015. Also the team’s holder on field-goal attempts, Ryan averaged 45.7 yards per punt in 2015 (16th in the NFL) as the Seahawks finished 29th in net punting at 37.9. But Seattle coaches often point out that Ryan’s value is greater than his numbers might suggest, as he often is asked to punt on a short portion of the field and high and directional to limit returns. Ryan is team’s all-time leader in just about every significant punting category, including yards per punt (44.8), long punt (77) and total attempts and punting yards. He is the fourth of the team’s unrestricted free agents to return, joining defensive tackle Ahtyba Rubin, wide receiver Jermaine Kearse and cornerback Jeremy Lane. Ryan’s return also means the Seahawks’ kicking battery of Ryan, kicker Steven Hauschka and snapper Clint Gresham will remain intact, as it has been since 2011. Best athlete in the world got 4 more years with the Hawks! @JonRyan9 boy it's LIT! @JonRyan9 @Seahawks that's great news!!! Congrats Jon! Maybe we will get a 3rd Canadian on the squad this year.